Thanks Skip, What do you think the watts linkage brings to the table over a track bar with as little of travel as this is going to have. I think my slow mind just answered that question---the track bar is going to be so short it is gong to pull the axle, and induce steer; if the steering gear is mounted to the axle? Also, given you experience with suspensions over the years, how would you compare Seth's suspension to the red car that Sumner posted? What I like about Seth’s car is the effective spring ratio is acting very near the end of the axle. Therefore it’s acting closer to the tire contact patch then a design using springs within the body. So the effective spring rate is closer to 90% which I believe provides better control in roll and lessens the potential for yaw. 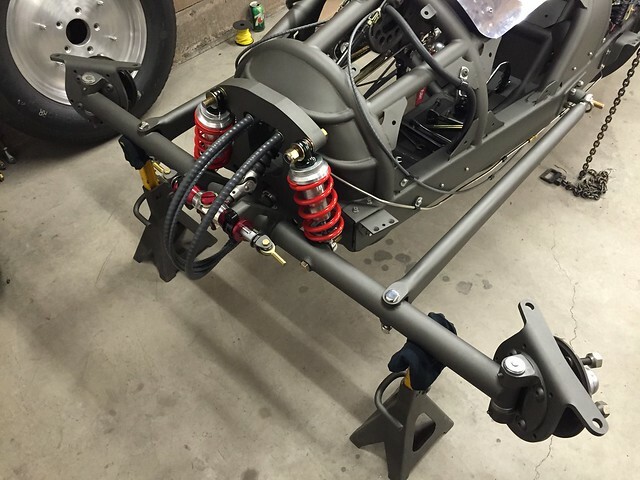 I experienced pitch/yaw/roll on my roadster until I made changes to the steering rack and moved the spring base outward toward the front axle ends. No more spin stickers. The lessen is; I knew better when I designed the roadster but convinced myself the only thing it would do is pitch. When I changed to a cross spring the car became stable. The watts link keeps the axle dead center in pitch, which I think is important at 300 mph. The above is why I think Seth’s car is so stable at speed. If we had an awesome, rock hard track than we could likely get away with a lot less wheel control as we’d likely only see pitch. I am just finalising my design (Gas Lakester) so am a true newbie - spending a lot of time reading forum pages. In terms of Watts linkage etc., given the chassis width restrictions (assuming the components are inboard), has anyone utilised a sliding block set-up - the easiest way to reference this is a search for the Alfa Romeo GTA rear end. Sorry, I cant figure out how to include a snip in a post. I'd be interested in why this is a bad idea (or better yet a good idea) as its currently my proposed set-up on a straight front axle. Another workaround is to take a screen shot of (whatever) and then post that. It almost always works fine for me, and since the file name includes the date -- it's never "already used". Your "sliding block" idea will work and quite well. I discussed this type of lateral locating device with Mark Ortiz, the suspension expert for Racecar Engineering magazine, and he said that it has been used on sprint cars and midgets and quite successfully. As you have said it all gets down to making the parts so that they will slide vertically and easily. Easy to figure out the roll center and very compact. I used a slide block for axle locating on the front of my bellytank. An aluminum bronze square block rides in the steel front shock support. I don't have a great picture handy but in the first picture you can see the hole in the center of the axle and the vertical slot behind it. Worked well other than the fact that it was a bit noisy at low speeds, I think the fit could have been a bit tighter but I didn't want to get any binding. 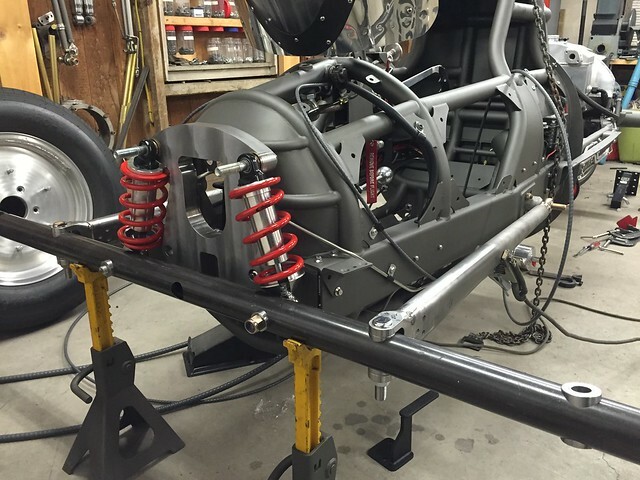 It was simple and compact, and since this was a front suspension redesign it worked in the space I had available. Thanks Sumner for the snips and Andy for a real world example (sliding block). I'll attach a sketch I did. My intention is that the springs / shocks will be lever operated though it has only just dawned on me that there must be a short intermediate link between the chassis and the shock lever arm (thinking the Seth Hammond front end) to account for the different arc lengths - I had thought this mechanism might contribute a little to axle control (fore and aft) but not if there is an extra pivot in the system. I had a wind tunnel guy convince me to go for rounded underbelly to bleed air and not have any ground affect and therefore no 'aero transitions' - unfortunately that means the fuselage tapers towards the ground and so keeping everything inboard (trailing arms, or 4-bars, or hairpin as I've drawn it) is within a relatively narrow space (not the full 24" as Bockscar has it) and that worries me for wheel control with a 44-48" proposed front track. You could replace the pin slider with a large ball or roller bearing. This would give lower friction and eliminate the lubrication problems. All you need for sliding track clearance is a few thousandths. Go back to my post on the first page of this thread and look at the way that we are locating the axle, skip all of the monkey motion that we went through to get the shocks inside the body. The axle is located by three arms, the lower ones, that also link the shocks to the axle and the middle one that is located approx 7 inches above the lowers and provides lateral location and also front to back location. It also provides the means to set the axle caster. Our axle is 44 inches between king pins and the front of our car is pretty lite, approx 400 lbs. All of this is located inside a tank that is around 13-15 inches in diameter at the axle area. We have ran this last year at the SCTA meet and even with the rough course we had no handling problems related to the front axle, that we know of at least. If you do go with a four bar or hair pin radius rods I would highly suggest using a three bar set up as it will prevent the inherent binding of a four bar or hair pin set up as they try to twist the axle in situations in which one wheel is raised above the other. I agree with our aero guy to go with a round section design, much more work but much better aerodynamics. Flat bottom cars are so much more easy to build but not optimum for aero. I had not realised that your Lakester had run (when looking at the pics you included in the thread). That gives me a lot of confidence to 'sign off' my front end thoughts and start designing some other detail. I have pretty much finished my waste pipe and duct tape model - I am not sure Tech will sign off on the duct tape though. It has proved invaluable. e.g. bail out (some changes in the knee area required - mentioned by someone already) and from the original drawings I have also made several changes to the cockpit length. My frontal area is a little large (I've read the threads - no comment needed) but by making a ply firewall and mating the engine to it I cant go much smaller without bulges so it is what it is. John I like you cage structure. A couple thoughts from a distance, so take them with a grain of salt. I'd think about giving yourself a bit more room above the helmet. Not sure if that helmet meets current specs. If it doesn't you might find that one that does is a fair bit larger and at this point you don't have any padding on the bar above it either. Both could soon crowd that area. I used an older helmet and now will have to raise the cage a bit. In the picture above I'm suggesting taking that step out of the floor bottom. Without it you can slide forward to get you head out easier and then slide your feet and legs back a bit to clear the bar with your knees. Doing this wouldn't add anything to your frontal area. Also on our cars the frontal area is the largest cross-section of the car, most likely at your back area or in the engine compartment. If so making things a little larger up front aren't going to impact the frontal area. Thanks for the comments Sumner. I have spent a lot of work time on your site and its links (hope my boss isn't on this forum). The stepped seat is actually really comfortable and I have no trouble with exit but, and your point is well made, while that is a new (borrowed motorcycle) helmet it is not necessarily a current Snell one and so I still have to go buy one of those before that roll structure is signed off. Sorry - my build pic has hijacked this front end thread. To recover a bit - the step chassis under the legs is intended to accommodate the axle (not aero) meaning it is mounted at a relatively wide part of the chassis allowing adequate body work forward of it to taper to the nose. Moving the axle ahead of the feet would mean adding at least a foot or more to the length and I can't see any advantage - I guess there is no disadvantage for length (except transport from England) and maybe surface area but I doubt my eyeball aero is subtle enough for that to be a factor. That makes sense..didn't realize the axle was in that area..